Stems: Stemless or nearly so, from woody taproot. Leaves: Basal, crowded, linear-oblanceolate, 1/2 to 3 inches long, up to 1/4 inch wide, stiff-hairy or nearly silky; margins entire. Inflorescences: Heads, 1 to 1.5 inch across, sessile among tufts of leaves. Flowers: Involucral bracts overlapping in 4-7 series, narrowly-lanceolate, tips pointed; ray florets 20-40, 1/2 to 1 inch long, less than 1/8 inch wide, white or pinkish, often with dark stripe below; disk floret corollas 1/4 to 1/2 inch long, yellow, tips sometimes pinkish or purplish. Fruits: Achenes, flattened, less than 1/4 inch long, pubescent; pappus of ray and disk flowers rigid, finely-barbed bristles, about twice as long as achenes. Habitat: Open, dry prairies and plains, often on eroding limestone slopes. Distribution: West 2/3 of Kansas. Uses: The Blackfeet used a decoction of the roots to treat tired horses. 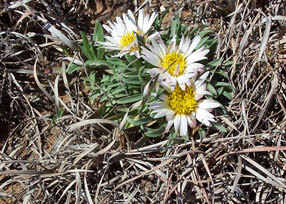 Comments: Easter daisy is one of our earliest blooming wildflowers. Named for David Townsend, 1787-1858, an amateur botanist in Pennsylvania. The ray florets curl under at night.